Before we dive into a look at TJ Hockenson, have a gander at my Big Board and take a listen to our latest episode of The Great British Drafting Show, where we run down the tight end position and what to expect from Thomas, Olsen and the newly-minted-with-a-contract Chris Manhertz. 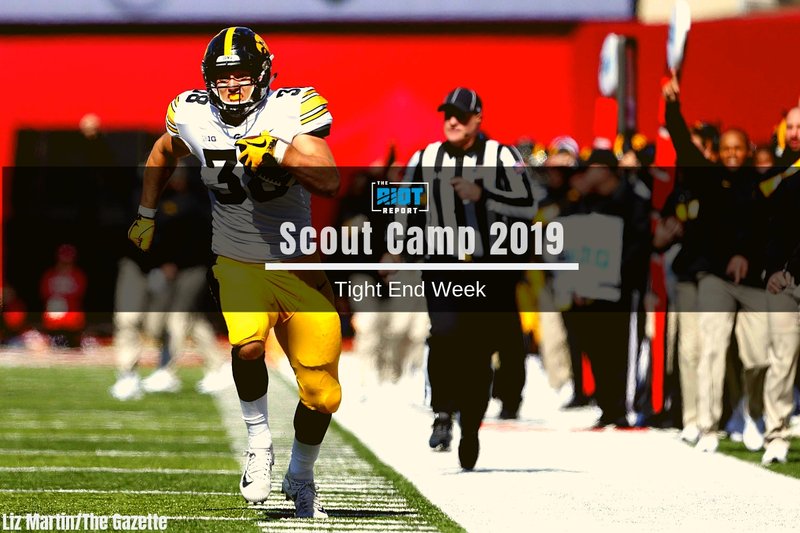 Seeing as the Panthers aren’t likely to target tight end early and that this draft class isn’t stuffed with appealing late round options at tight end, for tight end week we are taking a slight step back from our Panthers focus and instead looking in detail at the big three tight ends in the 2019 class. Having already looked at Irv Smith Jr., we now turn our attention to TJ Hockenson of Iowa. So what does Hockenson offer prospective teams, and how does this differ from Smith? He also did a good job of continuing to make effective blocks even after the defender was able to twist sideways – a move which often results in holds by blockers; by keeping his hands inside and using this control to push the defender from the side, where they aren’t able to put up as much resistance, he blocks more effectively. But he generally did a decent job of relocating. The only real concern with his hand usage from tape was his strength to deal with counter moves. It isn’t clear whether this is a strength issue that isn’t going to improve, something that can be worked on in an NFL weight room or if it’s simply a matter of playing with better balance, but this is merely a slight dampener on Hockenson’s otherwise good hand usage as a run blocker. What can also be seen from these earlier clips is Hockenson’s good but not amazing power as a blocker – in short, there shouldn’t be any concerns about him being pushed around as a run blocker, but he probably isn’t going to be blocking anybody off the field. In summation, Hockenson is a good blocker, possibly the best in the class, with his hand usage being particularly impressive, but while his pad level is probably something that can be fixed with coaching, his relatively persistent balance and control issues are more concerning and should be something that NFL teams look to explore in individual workouts.